Landseer was a frequent visitor to Abbotsford from 1824 onwards. 'He has painted every dog in the house' said Scott, 'and ended up with the owner'. The oil sketch is now usually ascribed to about 1824, Scott then aged 53. But the famous lint-white hair is no help and the date could be anywhere up to 1832 when Landseer made a number of pencil and ink sketches. 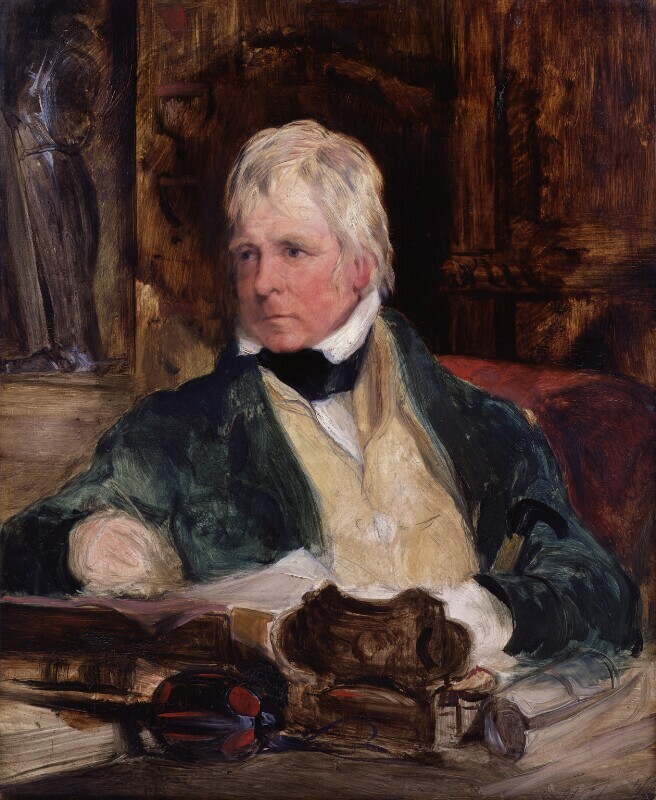 Graves dates it to 1832, Kitton posthumously to 1834 when Landseer visited Abbotsford again to paint 'Scott in Rhymer's Glen' for Mr Wells of Redleaf, now in private collection, New York. A watercolour miniature copy of the head by Jessica Landseer 1845 is Scottish NPG no.1379. NPG 391, one of Landseer's most perceptive portraits, is discussed with other portraits of Scott by Richard Ormond in Sir Edwin Landseer, 1981, pp 61-2. Half-length seated writing at a sloping desk in a green coat and buff waistcoat, paper, inkwell and Montrose's sword on the table; white hair, hazel eyes, rosy complexion; panelling and statue in background. Numerals scratched upside down lower right: 2/4 12.10 (R. Davy's price and size of panel). Landseer and his sale Christie's 8 May 1874 (312), bought Agnew for Albert Grant MP (Baron Grant) and given by him 12 May 1874. 'Landseer,' RA, 1874 (457); 'Wordsworth', Kendal and Southampton, 1970 (53); 'British Romantic Painting', Paris, 1972 (152); 'Scenes on Sundays', NPG, 1972-3; 'Sir Edwin Landseer', Philadelphia and Tate Gallery, 1981-2 (21). Apparently none, but mention of one by Charles Heath in Scott's Letters, XI, p 146.